Buddhism speaks of three jewels: the Buddha, the dharma, and the sangha. Although there are precise definitions for these terms in the Theravada1 tradition, they have relevance to Anthroposophy under slightly wider meanings. First, we will consider the meaning of these terms in Pali, the language of the Buddhist texts, then turn to their application to Anthroposophy. “Buddha” is a name given to someone who discovers (or rediscovers) for himself the path of liberation (of dharma) after this path has been long forgotten by the world.2 Siddhattha Gotama was the most recent Buddha, but a long line of Buddhas stretches into the past, and perhaps into the future. The term “sangha” has two meanings in Theravada Buddhism. The first meaning denotes the community of monks and nuns that follow the Buddha. This is the community of followers who have taken monastic vows. The second meaning links the sangha to the attainment of a stage of higher knowledge. According to this definition, the sangha is the followers of Buddha who have attained the first transcendent path (sotapanna, or “entry into the stream flowing inexorably to nirvana”).3 Both of these definitions are more restricted than how the term has been applied in the West. In the West, the sangha has come to mean the whole community of followers of the Buddha, not just those who have taken monastic vows, or those who have attained a stage of knowledge. There is a Pali term that is much closer to this western use of sangha, though this term (parisa) is virtually unknown in the West. Because of its common use, I will use sangha in its broad sense to mean the community of followers of the Buddha. The word “dharma” has several meanings: (1) a phenomenon in and of itself; (2) a mental quality; (3) doctrine or teaching; (4) liberation (nirvana); (5) the principles of behavior that a person should follow to fit into the natural order of things, or the qualities of mind that they should develop so as to realize the true “quality of the mind” in and of itself; (6) when capitalized, any doctrine that teaches such behaviour or qualities.4 Clearly, the term dharma is very rich in meanings, and deserves careful study. When we speak of the dhamma of the Buddha, we refer to both his teachings and to the direct experience of nirvana, the quality at which his teachings aim. In anthroposophic terms, we can speak of these same three qualities as attainment (Buddha), teachings (dharma), and the community that supports these two (sangha). 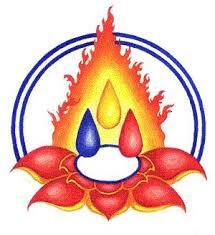 Of these three terms, “teachings” is probably farthest from the full meaning of its Pali equivalent (dharma). We can partially correct this problem by expanding on the idea of the teachings by considering three other closely related Pali terms, pariyatti, patipatti, and pativedha. Pariyatti refers to theoretical understanding that is obtained through reading and study. This is the business of most study groups and branches. Their aim is to build an understanding of Anthroposophy through study of Rudolf Steiner’s books and lectures. This aspect of practice may merely lead to an intellectual understanding of Anthroposophy, or it may be a stepping stone to experience. As Steiner emphasizes in Theosophy and How to Know Higher Worlds, study of the ideas of Spiritual Science can be the first step in higher knowledge. If our knowledge stops with intellectual understanding, we have remained at the stage of pariyatti, but if we have used our study to begin to traverse the path to higher knowledge, we have begun patipatti (practice). Patipatti is the practice of the teachings (the dharma) that we learn about through study. For many anthroposophists, patipatti will be a form of meditation, though artistic activity, work in service of others, and even the experiences of everyday life can be a form of practice if we approach them with the proper attitude.6 Practice, in this sense, is the vehicle that bridges the gap between intellectual understanding (pariyatti) and direct, first-hand realization (pativedha).7 Pativedha (realization) is the highest of the three aspects of the teachings (Dharma) because it is based in experience. As we become aware of our non-sensory experience, we are at the stage of pativedha. The practice of Anthroposophy that culminates in direct experience is supported by the community of people who share the same path (the sangha). The assumption that individuals can enter the spiritual worlds alone through their individual striving, cannot be supported either from a study of Buddhism, or from a study of Steiner’s writings and lectures. Certainly, spiritual sight depends on the desire and ability of the aspirant to purify him or herself. However, it is not true that success depends only on the individual. 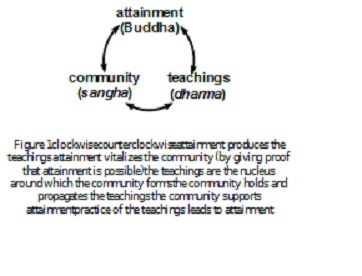 The community of people who follow the same path (the sangha) plays an essential role in supporting this striving. In Buddhism, this fact is recognized by giving the sangha a place as one of the three jewels. Our knowledge of Felix and the “other personality” comes from a remarkable lecture Steiner gave in Berlin, February 4, 1913.9 The occasion of this lecture was an assertion made by Mrs. Annie Besant, the then President of the Theosophical Society, that Steiner had received training as a Jesuit. Steiner felt it necessary to refute this assertion for several reasons. Up through 1912 Steiner had been the General Secretary of the German Section of the Theosophical Society and was in some ways subordinate to Mrs. Besant. The relationship between Steiner and the other leaders of the Theosophical Society had been strained since 1907, when the German Section of the Society hosted the biannual congress and introduced innovations that did not please members from other countries.10 The rift grew over the next few years, with Mrs. Besant and her colleagues preparing for the incarnation of the new World Teacher, who would be a reincarnation of Christ.11 Steiner strongly disagreed with the assertion that Christ would reincarnate, and lectured widely on Christianity in an attempt to show the true meaning of his incarnation. The final break with the Theosophical Society came in early 1913, when Mrs. Besant wrote an official letter intimating that Steiner was no longer the head of the German Section.12 The charge that Steiner had received Jesuit training, and even that he had been ordained as a priest, had been published in several Jesuit books and magazines for some years. Although he had attempted to set the record straight, the false rumors persisted. Now that they were being promulgated by Mrs. Besant, Steiner felt that he must speak openly about the course of his life. His lecture of February 4 gives us one of the few glimpses of his personal life and relationships in the years before he assumed the leadership of the German Section of the Theosophical Society in 1902. In this context, Steiner speaks of two people who served the important function of providing a community in which he could develop his spiritual sight. In addition to deepening of his spiritual sight, it is likely that the training offered by the “other personality” served to introduce Steiner to his higher ego. In the 1913 lecture, Steiner says of the paths and steps that he was led to follow “These particular streams that pass through the occult world, which can be recognized only if one bears in mind a double stream moving forward and backward, appeared in a living way before the boy’s soul.15” To understand what he means by this sentence, we need to turn to another of his writings. In the final chapter of How to Know Higher Worlds, Steiner makes it clear that the stream from the future bears the Greater Guardian of the Threshold, an aspect of our higher ego.16 By combining these two sources we can see that Steiner is telling us, without explicitly saying so, that his meeting with the "other personality" was an initiation experience for him. He met his higher self through this experience. This meeting is a deeply personal and significant experience. It is important to realize that Steiner did not come to it alone. He had support form a community, all-be-it a small one, in the form of Felix, the "other personality," Fichte, and the "anticlerical book." It is easy for us to neglect this community and discount its effect on Steiner, but these influences were essential. Without them, the Rudolf Steiner we know would not have existed. Without Felix, Steiner’s initiation into the higher worlds would likely have come in a quite different way, with who knows what results. We are all dependent on these types of communities. We undertake self-development as members of a community, or we do not undertake it at all. The fact that the sangha is one of the three jewels of Buddhism helps us recognize the important role that community plays in spiritual development. Without a sangha, there can be no attainment, but without attainment there can also be no sangha. The sangha and attainment are intimately linked. If there had been no attainment (no Buddha) there would be no sangha. The sangha was initially composed of the five monks with whom Siddhārtha Gautama practiced austerities. If none of them had attained liberation, they would eventually have dispersed and sought other means to enlightenment, as had already occurred several times. After the Buddha’s awakening, these monks, and others who joined them, were the first to accept his teachings and became the first vehicle for their promulgation. As the first sangha, they heard and recorded the Buddha’s sermons, and advanced toward enlightenment in the process. These sermons are now preserved as part of the Pali canon of Theravada Buddhism. The sangha has provided a vehicle for the publication and dissemination of these texts. Without the sangha there would be no Buddhist teachings today. This is true with respect to recording the teachings, but also with respect to their genesis. During the Buddha’s life, the existence of the sangha was an important cause of the Buddha sermons. If there had been no one to receive them, it is highly unlikely that the Buddha would have taught as he did. If no one ever stopped to listen, his sermons would soon have ended. Without followers, the young movement would have quickly died out. The sangha is thus necessary for both the origin and the continuation of the teachings. The relationship between attainment (Buddha) and the teachings (Dharma) is also intimate. The Buddha’s teachings spring from his attainment. He himself makes this clear in his first sermon. Without attainment, there would be no teachings, but the relationship between attainment and the teachings goes deeper than this. Once the teachings have been given, they must be kept alive not merely preserved. Teachings that exist only as texts that are never read, or that are read but not understood, are not true teachings. To be living, the teachings must be understood. This requires some degree of attainment. In Buddhism, this relationship is demonstrated from the very beginning. When the Buddha finished his first sermon, the monk Kondañña attained the first stage of awakening, and thus gave birth to the ariya sangha (noble sangha).18 Kondañña attainment shows that the teachings are living realities. After the Buddha’s death, attainment continues to play an important role in Buddhist life. Without the level of understanding that comes from direct experience, the Buddha’s sermons would soon pass into obscurity. They would exist as texts that had no meaning. No one would be affected by them. To be affected by them means to have understood them (pariyatti). To have understood them, means to have worked with them (patipatti). To have worked with them leads to direct experience (pativedha). If it does not, the teachings are dead. One could even say that they are no longer true. It is not that the words on the page have become lies. It is that what is written no longer has any connection with experience. To return the teachings to a state where they can be understood requires attainment. This attainment must be of the same nature as the original attainment. It must be implicitly the same as the attainment that produced the teachings. We might say that it is qualitatively the same, even if at first it seems quantitatively different. When this happens, when the community fails, there is no longer any support for attainment. It would be as if, following the Buddha’s sermon, Kondañña had gotten up, yawned and said “I am glad that is over! I think I will go bathe.” If the teachings are not seen as relevant, there can be no community, no group of people who support each other in their striving and attainment. Without the community, attainment fails. Without attainment, the teachings are not understood and cannot be kept alive. Without living teachings, the community fails. Instead of a positive, mutually reinforcing system, a vicious circle ensues. The jewels of Buddhism must shine together, or none can shine at all. The relationships between the three jewels can be summarized in a diagram. This relationship is intimate and profound. Each jewel is dependent on the others in order to function properly. If the jewels have become tarnished, a way out of the prison of failed interactions must be found. To help with this we can turn to the writings of a contemporary Tibetan Buddhist nun, Pema Chodron. Pema Chodron speaks of three qualities that we already possess, that can be ripened and matured, and that can lead a community out of these failed interactions. These are the qualities of precision, gentleness, and letting go. The cultivation of these qualities can restore the jewels when they have been tarnished. “When the Buddha taught, he didn’t say that we were bad people or that there was some sin that we had committed – original or otherwise – that made us more ignorant than clear, more harsh than gentle, more closed than open. He taught that there is a kind of innocent misunderstanding that we all share, something that can be turned around, corrected, and seen through, as if we were in a dark room and someone showed us where the light switch was [precision]. It isn’t a sin that we are in the dark room. It’s just an innocent situation, but how fortunate that someone shows us where the light switch is. It brightens up our life considerably [gentleness]. We can start to read books, to see one another’s faces, to discover the colors of the walls, to enjoy the little animals that creep in and out of the room [letting go]. Precision always involves a clear recognition of what is seen. For instance, when we become aware of an assumption, precision allows us to see not only the assumption but also the fact that we hold it. We may think “There has been no attainment following the anthroposophical path of development.” When we become aware of this assumption, and are precise about this awareness, we realize “Ah! I think that there has been no attainment.” This recognition that “I think” the assumption allows us to take a step away from it, and to begin to see that the assumption is not something that must be true; the assumption is merely something that “I think.” The possibility that one is wrong now opens up. We begin to wonder about our original thought. We begin to question it. In becoming curious about this thought, we are already applying the second quality: gentleness. Through gentleness, we learn to question our assumptions without being harsh with ourselves. It is very easy to turn our precision on ourselves and feel that we are defective because we have assumptions. Gentleness toward ourselves prevents this. It allows us to open up, to step away from our assumptions into a world whose boundaries have not been explored. As we gently explore the assumption that there has been no attainment we can begin to open to the possibility that we do not have to work at an attainment that will only be achieved in the distant future. We begin to open to the possibility that we are perfect just as we are. This realization frees us to work productively on ourselves. Instead of trying to attain something that we know (i.e., assume) will take many lifetimes, we now work knowing that what we are doing at this moment is already perfect. When we accept this, we open ourselves to the stream of time that flows to us from the future. This stream carries our higher self to us. This self has already attained all that we desire. From our perspective in the present, this attainment will only exist in the future, but from the perspective of that future, we as we exist now are the goal of our striving (from the future toward the past). Our higher self flows toward us. If we assume that it cannot reach us, that there can be no attainment for us in the present, then we interfere with its approach. But if we accept that we are already perfect, then the future comes to meet us, and we are perfect. We create the conditions under which the future can come to us. From the perspective of the reverse stream of time, the future has already happened. We only have to realize that this is so to make it real in our lives. Through precision and gentleness, we learn to let go of our assumptions. Letting go is the third quality that we can ripen, but it is not something we do actively. Letting go is something that happens when we apply precision, with gentleness. We do not have to “let go,” it is not an activity that we can control or manipulate. It is more like grace. It depends on our receptivity, but it comes on its own, in its own time. Letting go allows us to open wider, to take in more of life, to accept pleasure and pain with the same welcoming spirit. To say yes, to whatever life brings us. We can apply these same qualities to a second assumption that is often found among anthroposophists,that the teachings of Anthroposophy cannot be improved upon. First, there is precision: there is the recognition that something is wrong. We notice that some anthroposophists think that their path is better than others; we notice what this recognition does to us. It causes us to feel inwardly tense, to be critical of other spiritual streams, but also to be critical of the anthroposophical path. We know that feelings of superiority are not a sign of high spiritual development. We find ourselves pulling slightly away from all paths. We become more isolated and critical. Then, because we have chosen to be gentle with ourselves, we ask with great gentleness “What is that about? What is it about that I feel critical and isolated? Where does this come from?” We start to develop a great curiosity about these questions. Our gentleness towards ourselves transforms our thoughts and feelings into amazing jewels that we marvel over, and wonder about. “Where do they come from? Isn’t that one interesting?! What fascinating things lurk inside me.” We do not need to answer these questions. If we merely hold them with gentleness, we find that we begin to let go of the assumptions we previously carried. The assumptions begin to dissolve on their own. We do not need to work at this. It just happens as a result of our precision and gentleness. Now, because we have fewer assumptions, we become genuinely curious about what others think. We might begin to find links between the anthroposophical and other paths of self-development. We might write an article on these links. We begin to say “and” instead of “but” when we encounter new teachings. We begin to enlarge the anthroposophical canon, to contribute to and improve the teachings, to make them relevant to the world today. The thought that Anthroposophy has any fixed teachings is now far behind us, for we are creating those teachings as we learn. The teachings have come to life for us. A final assumption that is sometimes encountered, that self-development is a matter only for the individual, can be dealt with in a similar manner. Precision allows us to see that this assumption is not a fact, it is merely something that “I think.” With gentleness, we begin to ask ourselves “Why do I think this? Why do I think that self-development is a matter only for the individual? What experiences have contributed to this idea? How do I feel about my achievements and myself when I think this? Isn’t it interesting that I have these feelings around this issue?! Why do I feel them?” Through this process, through precision and with gentleness toward ourselves, the assumption begins to release us. We begin to see that many people have helped us, and that we have helped many others. We begin to see the community that already exists among the followers of Rudolf Steiner. This is the community that so many people seek today. We realize that it has only been our assumptions and our harshness with ourselves that have kept us from participating fully in this community as students and as teachers. When we let go of our assumptions about attainment, about the teachings, and about the role of community, we free ourselves from the dysfunction that occurs when the three jewels are misunderstood. We are then able to see the three jewels of Buddhism, and of Anthroposophy, in their true light. The whole that now becomes visible has always been present. Its radiance has just been temporarily obscured by our assumptions. Once we are free of these, the jewels shine again. The qualities of precision, gentleness, and letting go, enable us to embody the spiritual power of love. This power of love is not something abstract. It is a real force in our lives. We only have to allow it to manifest itself. Recognizing the three jewels of Anthroposophy can help with this process. 7 From this, we see that there is a gradual intergradation among pariyatti (study), patipatti (practice) and pariyatti (realization). These three activities flow into each other, provided the student approaches them with an attitude that allows this. 9 Steiner, R. 1913/1985. Self-Education: Autobiographical reflections 1861-1893. Mercury Press. Spring Valley, NY. 14 Steiner, R. 1925/2000 Autobiography. Anthroposophic Press, Hudson, NY. 19 Chdron, P. 1991. The wisdom of no escape. Shambhala, Boston. pp. 13-14. 20 Chodron, P. 1991. The wisdom of no escape. Shambhala, Boston. p. 14.